Posted: Sun Apr 08, 2018 4:46 am Post subject: Tutankhamun A Warrior King?
" King Tut, The Boy Soldier? Here's What Other Stories Aren't Telling You. " (Live Science - Owen Jarus, 29.03.2018). A few weeks ago there was a very good documentary about this on TV with information that was completely new, particularly about Tutankhamun's cuirass and how it was constructed. I would debate their findings that he was a warrior pharaoh though as they ignored the physical issues that his mummy shows. His left foot rather mitigates against a very active lifestyle. Then there is the scene on a box of him and Akhesenamun, where he is sitting down to shoot an arrow, why sit down if you are a fit young warrior pharaoh? Why have so many walking sticks as well. I suspect that what we see is perhaps an ancient example of the tricks used to hide the incapacity of FDR from the public. Who knows, maybe Tutankhamun did ride in a chariot, but held in place by some type of harness as he would have had a bit of difficulty with that pesky left foot in maintaining balance in a chariot bouncing about. from seeing you as a very fact based individual, I find it hard to believe anything found in tut's tomb would encourage you to post something which is not proved? Tut's tomb is basically a cache of objects thrown together. How do we know this is from anything to do with Tut? ... Tut's tomb is basically a cache of objects thrown together. How do we know this is from anything to do with Tut? The objects from KV 62 were made or were re-dedicated for the funeral of Tutanchamun, come from his personal possession (right down to his underwear) or can be referred to as so-called "family souvenirs". I personally have never claimed that the obvious traces of use on the harnisch are a clear evidence of a "warrior king" Tutanchamun. However, one must admit that they can be an indication (along with others, such as the traces of use on the chariot, the reliefs described by Johnson, etc.). And, participation in a battle, and death as a result of injuries sustained there, would also be a logical explanation for the anomalies in the mummification of the king. Quite right to not take a single artefact as evidence of a "warrior" lifestyle. That said, the fact that a king appears to have had disabilities did not stop Siptah from ruling effectively, and W.R. Johnson has postulated that a wall found inside Horemheb's third (?) pylon at Karnak recount a Tutankhamun war with Syria that actually occurred with the king at the forefront. There are unique features to the battle scenes, argues Johnson, that indicate a factual occurrence, rather than a symbolic battle scene for ritual purposes. Johnson notes that it is Tutankhamun who starts the ritual battle scene imagery on walls of temples and tombs, as a predecessor to the Ramessid period (this is also support by Murnane, 1990). Johnson has also argued that these scenes may actually lengthen the reign of the king from 10 to 12 years. Johnson, W. R. 1992. 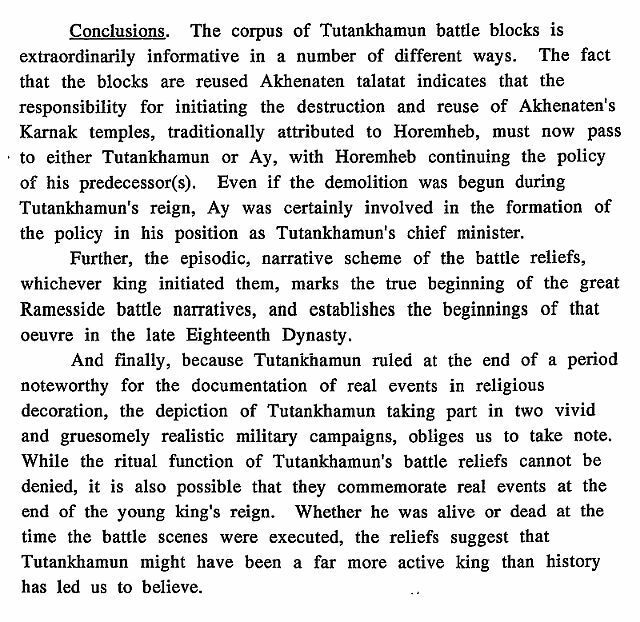 An Asiatic Battle Scene of Tutankhamun from Thebes: A Late Amarna Antecedent of the Ramesside Battle-Narrative Tradition. Ph.D (Unpublished), The University of Chicago: Chicago. Murnane, W. J. 1990. The Road to Kadesh: A Historical Interpretation of the Battle Reliefs of King Sety I at Karnak. Studies in Ancient Oriental Civilizations. SAOC 42. Chicago: Oriental Institute. A Summary of Johnson's theory shows that perhaps Tutankhamun's death occurred from the Syrian battle. I know that a Channel 5 (UK) series, King Tut's Treasure Secrets [Part 1 of 3], postulated something similar, though I did not watch this documentary. While having a club foot (such as Siptah had, and has been proposed as well for Tutankhamun) may mean an instability for walking, the evidence of over 100 walking sticks in KV62 could argue that the king was able to steady himself in battle to strike blows against an enemy, though more recent examinations of his mummy appear to argue against his conducting battle from a chariot. A cuirass was signs of wear doesn't seem to me to be very convincing evidence of its wear in a specific environment, such as battle-- it could just as easily have been in a controlled 'training' environment, on a hunt, or during a 'show the pharaoh to the troops tour,' as it were. I'm inevitably reminded of King Gama's son Arac singing about removing his cuirass to go into battle (after having worn it the entire play). ... The historical implications are profound. Contemporary reliefs in the private tomb of Horemheb preserve scenes showing Syrian and Nubian prisoners being brought before Tutankhamun, as well as a military camp scene. The grisly details in the Tutankhamun mortuary temple battle narrative suggest that they were observed and recorded on the battlefield during real campaigns. Egyptian art at this time stressed truthfulness. Tut's presence in these scenes indicates that the young king participated in these campaigns. Horemheb and Ay - the latter taking the throne; was the former either occupied with a crisis situation or perhaps *seen as* responsible somehow - the king killed while under his protection? The reliefs being taken down by Horemheb at a later date. As already said several times, these traces of use alone certainly not. But it forms a circumstantial evidence chain with look on the other mentioned indications / findings. Stipulated. And we have strong indications that at least some pharaohs did in fact lead their troops personally. We're also pretty certain that some of the "pharaoh-in-battle" scenes are purely formulaic, to represent pharaoh repulsing the forces of evil/chaos/whatever. So while I will admit the evidence is suggestive, I don't think it verges into anything like certainty.